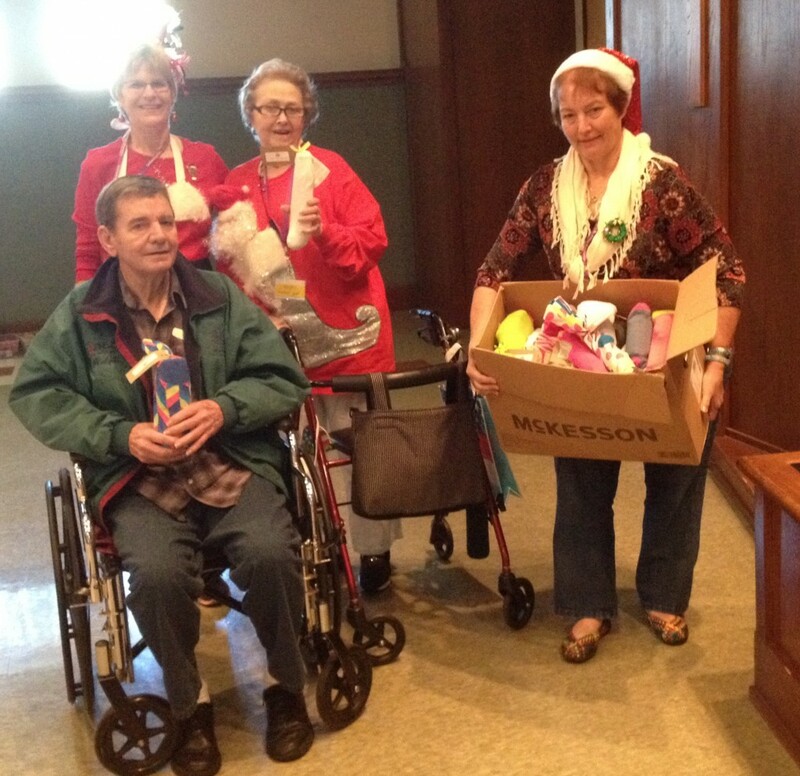 THE GATHERING PLACE recognized Country Village Care residents Ralph Peltier and Ruby Kramer for donating Bingo prizes and their time to fill over 80 Socks of Love that will be distributed to people in our community who are in need of them! The Socks of Love was a project created over a year ago by The Gathering Place volunteers. It consists of a pair of socks (one inside the other), filled with toiletries such as soap, toothpaste, shampoo, etc. The project began as a Gathering Place event and the initial goal was to fill 165 socks with items purchased or donated. That was accomplished, and Ralph decided to continue the efforts using his Bingo prizes and whatever other donations came from various donors. He recruited his friend Ruby Kramer, and together, they have donated three loads (each consisting of 60-80 socks) of Socks of Love to The Gathering Place for distribution. The third “load” was presented to The Gathering Place project coordinator, Pat Williams, by Ralph and Ruby at the annual Christmas Party on December 3, 2015. There was a slide presentation that showed the beginning of the project and the efforts made. The crowd was so moved by the unselfish time and love given by both Ralph and Ruby that they gave them a standing ovation.